This is an exceptional dram we have just received and as both Jim and Nicola have both visited this great Island and Jim has certainly enjoyed all the Jura expressions and one of his all time favourites is Superstition. Nose…Soft runny honey, zesty citrus notes, spicy cinnamon and plenty of wood. Taste…Elegance in a glass, Dark chocolate, tropical fruit cakes, just the slightest hint of salty sea spray and peat. Finish…Spices all over the place, sweet oranges a medium finish leaving your palate quite dry. Nose…The aroma’s tell me I am going to love this one, Sweet fudge and honey, some oak and delicate spice. Finish…Subtle and sweet, green apples and chocolate with some Christmas pudding with vanilla custard over the top, a delight. 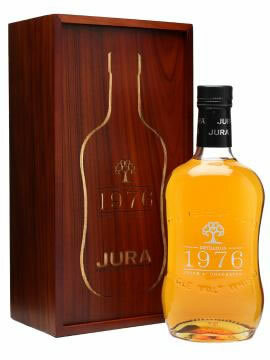 This is a diamond from the Isle of Jura and at just under £500.00 a bottle it is not cheap by any means, is it worth it? yes it is. This is an elegant and full flavoured dram, sure to be in a collectors cabinet. 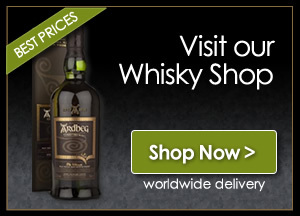 You can maybe obtain one from your specialist Whisky shop but it is available on-line (see our shop window below). The Whisky Boys loved this dram and after tasting this one we finished for the evening, an enjoyable evening was had by both of us.